This map of the cosmic web was generated from imprints of hydrogen gas observed in the spectrum of 24 background galaxies, which are located behind the volume being mapped. Image by Casey Stark (UC Berkeley) and Khee-Gan Lee (MPIA). The technique of Lyman-alpha tomography is represented in this illustration: As light from distant background galaxies (yellow arrows) travels through the universe towards Earth, hydrogen gas in the foreground leaves a characteristic imprint ("absorption signature"). 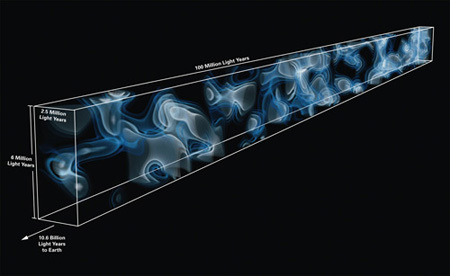 From this imprint, astronomers can reconstruct which clouds the light has encountered as it traverses the "cosmic web" of dark matter and gas that accounts for the biggest structures in our universe. Image by Khee-Gan Lee (MPIA) and Casey Stark (UC Berkeley). 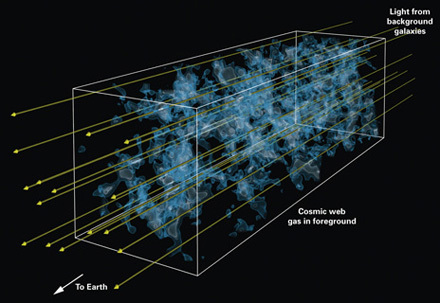 The three-dimensional map, which spans millions of light years across, provides a tantalizing glimpse into the large structures of the 'cosmic web', which form the backbone of the cosmic structure in the universe. Galaxies like our own Milky Way are embedded inside this cosmic web, and fill only a tiny fraction of its volume. This is the first time the cosmic web has been mapped at such a large distance—a slice of the universe approximately 11 billion light years away. When astronomers observe to such immense distances, they are also looking back in time. With this glimpse into the past, the map reveals early stages of cosmic structure formation during an era when the galaxies were undergoing a major ‘growth spurt’. According to Prochaska, the map will help astronomers understand how galaxies in the universe have evolved since the Big Bang occurred 13 billion years ago. The map was reconstructed by using the light of distant background galaxies passing through the cosmic web's hydrogen gas. This concept is similar to a medical CT scan, which reconstructs a three-dimensional image of the human body from the X-rays passing through a patient. Prior to this research, using starlight from galaxies for this purpose was thought to be impossible – until Khee-Gan Lee from the Max Planck Institute for Astronomy carried out calculations that suggested otherwise. To create the map with this technique, Lee and his team observed galaxies on one of the largest telescopes in the world, the Low-Resolution Imaging Spectrograph (LRIS) on the Keck I telescope at the W.M. Keck Observatory on Mauna Kea, Hawaii. "I was surprised to find that existing large telescopes should already be able to collect sufficient light from these faint galaxies to map the foreground absorption, albeit at a lower resolution than would be feasible with future telescopes,” says Lee. “Still, this would provide an unprecedented view of the cosmic web which has never been mapped at such vast distances." While trying to collect the data, Lee and his colleagues were plagued by a problem more terrestrial than cosmic – bad weather. "We were pretty disappointed as the weather was terrible and we only managed to collect a few hours of good data. But judging by the data quality as it came off the telescope, it was already clear to me that the experiment was going to work," says astronomer Joseph Hennawi (MPIA), who was part of the observing team. The data they collected was completely unprecedented, even with only four hours of observing time. They carried out absorption measurements using 24 faint background galaxies, which provided sufficient coverage of a small patch of the sky to be combined into a 3-D map of the foreground cosmic web. Astronomers now hope to create an even larger map to glean further insights into the structure of the adolescent cosmic web and its function.